Lord of the Rings fans know that Barad-Duris the fortress that Sauron built. It was partially destroyed at the end of the Second Age but since Isildur failed in destroying the one ring, the castle’s foundations remained. Being scrappy, Sauron used his minions to rebuild it. 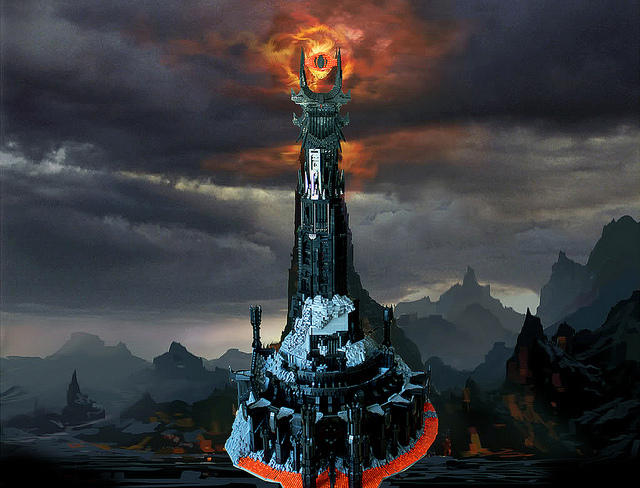 When his all powerful ring was tossed into Mount Doom, his fortress was destroyed for good. Kevin Walter is a fan of Lord of the Rings. How do I know? Look what he does in his free time. Kevin has built a replica of Sauron’s fortress from Legos and he did it old school, without any computer programs to help him design it. He used images from a collectible model of the tower to help him get the details right and used around 50,000 bricks. More power to you Kevin, though not the evil kind. More pics of his fantastic fortress can be seen here.